May 24, 2010: Therese filled in. April 26, 2010: Bennett4Senate filled in. February 15, 2010: Keili filled in. January 25, 2010: Duane filled in. November 30, 2009: Keili Hamilton filled in. November 23, 2009: Dave Mandl filled in. September 28, 2009: Betsy filled in. 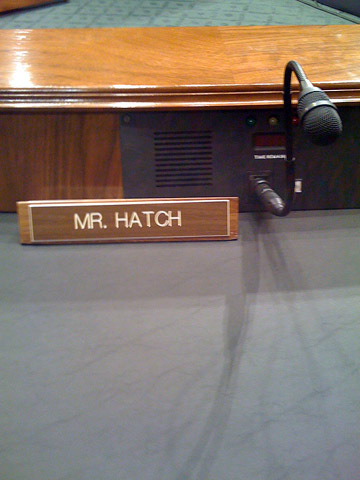 September 6, 2009: Duane filled in for Hatch. July 27, 2009: Brad LaBonte filled in. July 6, 2009: Bill Mac filled in for the regular time slot late Sunday/ early Monday morning. September 16, 2008: Scott Williams filled in. August 19, 2008: Scott Williams filled in. May 13, 2008: Doron filled in. April 22, 2008: Bob W filled in. March 25, 2008: Irwin filled in. February 5, 2008: Bob W filled in. January 1, 2008: John Allen filled in. December 25, 2007: Steve Krinsky filled in. December 26, 2006: Todd-o-phonic Todd filled in. August 28, 2006: Trent filled in. August 14, 2006: Trent filled in. July 3, 2006: Trent Wolbe filled in. May 22, 2006: Bill Mac filled in. April 24, 2006: Martha Hurley filled in. April 17, 2006: Jason Elbogen filled in. December 25, 2005: Rix filled in. November 28, 2005: PGB filled in. September 17, 2005: Moshik Temkin filled in. August 27, 2005: The Good Doctor filled in. May 29, 2005: Andrew Listfield filled in.